Maia Shibutani and Alex Shibutani perform to Coldplay at the 2016 U.S. Figure Skating Championships. Maia Shibutani and Alex Shibutani edged out defending champions Madison Chock and Evan Bates to win their first national title at the 2016 U.S. Figure Skating Championships on Saturday. Madison Hubbell and Zachary Donohue maintained third place, followed by Anastasia Cannuscio and Colin McManus. 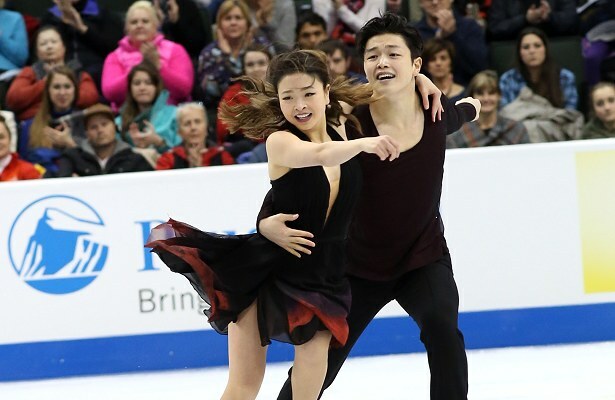 The Shibutanis showed good connection to their music by Coldplay, and while they are a brother-and-sister team, their free dance exuded a natural honesty and fluidity throughout. The team earned a level four for all elements, including their diagonal and circular steps, along with oodles of +2s and +3s for grades of execution (GOE). Their twizzles brought the audience to their feet, and after a standing ovation at the end of the dance, the five-time senior national medalists earned a score of 115.47 for first place. With a total score of 190.14, they captured the gold with just over three points to spare. Chock and Bates earned 111.79 points for a second place finish in the free dance with their routine to Rachmaninoff’s “Piano Concerto No. 2.” Though the program is still new, the team seems to be settling into it well and they showed attack and veracity, looking comfortable throughout. They too, earned many positive GOEs and level fours with the exception of their dance spin (level two) and diagonal steps (level three). Their total score was 186.93. Hubbell (24) and Donohue (25) found themselves in a difficult place to skate after the standing ovation the Shibutanis received, however, they used the energy to their advantage in their dark and dramatic free dance to “Adagio for Tron” by Daft Punk. The edges in their level three footwork have noticeably improved and the team showed exquisite lines and intricate transitions. They finished third in the free dance (107.71) and overall (178.81). Anastasia Cannuscio and Colin McManus were fourth (160.46), followed by Kaitlin Hawayek and Jean-Luc Baker (158.86). The top three teams will go on to compete at both the Four Continents Figure Skating Championships and World Figure Skating Championships this year.